Canned food products are essential in every household. It is necessary when you go on trips in the woods or in the mountains. Canned food is an easy way to prepare meals and is eaten as the main dish or as an addition to it. Export Portal's Canned Food section offers a great opportunity for buyers and sellers of canned food to connect to each other for a successful business. Sell canned food online on our site and increase sales using the possibility of gaining customers from all over the world. Selling canned pineapple, canned spam, canned tomato juice, canned tomato soup, canned carrots, canned tomato sauce or canned peas, choose our site for the best results in your business. Buy canned corn, canned spinach, canned Vienna sausages, canned fish, canned water, canned vegetables online on Export Portal, use our big choice of sellers from all parts of the world. Canned food is very helpful in cooking nowadays - the rhythm of life doesn't give us much time to cook at home on weekdays, canned food will be a good decision. Whether you're trying to include more veggies in your family's weekly meal plan, shorten your prep time with ready-to-use ingredients, or just stock up on non-perishable items, canned foods can satisfy every kitchen's needs. For a delicious salad that can even serve as a main course, combine fresh vegetables with canned tuna or canned salmon, or add a can of chicken or canned beans. Cook up a homemade soup by combining canned broth with canned vegetables and meat or beans, or add some fresh veggies to your favorite canned soup to give it a more home-cooked flavor. Making your own chili is easy with canned tomato puree, a can of beans, chili seasoning and a bit of water. Or add some canned meat or seafood to packaged mac and cheese for a comforting entree. 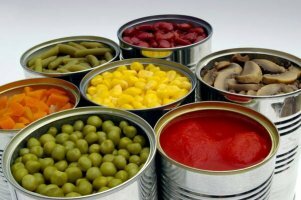 Shop for canned food online on Export Portal, find all types and brands of tinned food. If you want to sell baked beans, canned asparagus, canned ham, canned sardines, canned mushroom soup, canned mushrooms, canned peaches, canned pears or canned olives online, you are in the right place. Export Portal helps get best and easy deals, provides secure trade and help with shipping. Trade with Export Portal, find the right place to sell agri-food products and expand your business overseas with us!